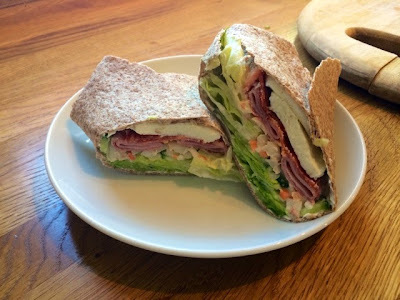 There’s nothing better than absolutely jam packing a sandwich or a wrap with lots of yummy things, I absolutely cannot stand those horrible limp sandwiches with one measly slice of ham. This one packs slightly more calories than my usual wraps coming in at 574, but well worth it and a great tasty reward (that’s still healthy) on a workout day where I allow myself to eat a little more. I’ve called this the Italian deli wrap as the combination of a couple of different meats, the coleslaw and the mozzarella really gives it a proper New York Italian deli flavour.